09:42:00 Makes 4 servings, 1 ramekin (125 mL) each. Creme brulée is a classic dessert that's easily made at home. 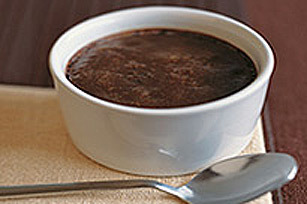 Just follow the simple steps in our Chocolate Creme Brulée recipe and you'll see for yourself. Our rich, decadent chocolate creme brulée recipe is a must-try! Baked custards can be refrigerated up to 24 hours before topping with sugar and broiling as directed. Serving Size Makes 4 servings, 1 ramekin (125 mL) each.